WE HAVE AVAILABLE BOXER PUPPIES IN THIS LITTER. We have 1 available boxer puppy left in this litter. Tails have been docked and dew claws removed . HAVE YOU ORDERED YOUR NUVET ? 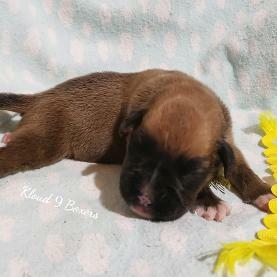 Please go to our "Upcoming Boxer Litters" page or our "Upcoming Pug Litters" page to see our upcoming pairings. If your interested in reserving a spot on any of our upcoming litters, please go to our "how to reserve your puppy" page.